Hi everyone. Here is the birthday card I made for Darnell (djkardkreations). Her birthday isn't until next week, but for some reason, all the planets aligned with Canada Post and USPS and it arrived early. So now that Darnell (aka Dolly to me!) has received her card, I thought I'd share it with you. I inked up my "new-to-me" stamp from SU! called Vivid Vases. I was inspired to buy this after seeing several beautiful cards made by my friend Nancy. I just love the sweet little vases filled with flowers, and I colored it up brightly with Copics to send off with birthday wishes to Dolly. Super simple card ... stamped, colored with Copics with some Crystal Effects added to the vases for dimension and shine. I'm entering this into two challenges: CAS on Sunday #36 - Birthday ... and ATS&M #101 - Anything Goes. I am so excited. I already know a few of the other Design Team members, and am looking forward to getting to know the rest of this creative group of crafters. Our first challenge goes live on July 1st ... I hope you'll play along with us - it's going to be a lot of fun!! WHAT'S A MIXED MEDIA CARD? Straight up, a mixed media card is a card that is created using a variety of mediums. Even using various tools and supplies is okay. Some examples: die-cutting machine (manual or electronic), monoprinting tools (Gelli plate), embossing folders, punches, dies, stencils, templates. Labels: CAS, copics, friendship, Stampin' Up! Love this CAS beauty, Loll! Colors, textures, and design are just delightful! Gorgeous Loll - bet she loved it! Crystal Effects really bring it to life. Love this Loll! Gorgeous alternating colours and the glazed crockery looks so dimensional! Congratulations on your DT appointment! I will check out this challenge and looking forward to your creations! Love the shine on the vases - such a pretty card. I'll bet Darnell was thrilled. Thanks so much for playing along with ASM this week! BTW - congratulations on the new DT post! Love the glossy vases and pretty colors, Loll! And congrats again on your Design Team post! I'll be checking that challenge out! This is simply beautiful, Loll!! Love those sweet little vases with the shine on them!! Darnell definitely loved them as much as I do!!! Congrats on the DT spot!! Love the glossy vases with their beautiful flowers, I'm sure Darnell loved it! Awesome card for Darnell! Congrats on the MM gig - I can't wait to see who made the Team! What a lovely birthday card Loll. 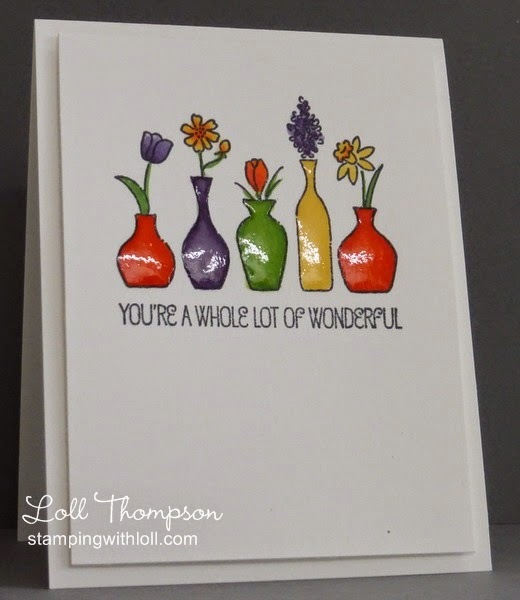 I was so pleased to see you highlighted on Splitcoast Stampers this week! You are becoming the Queen! Loll, beautiful card. I have that stamp set, must get it out. Congrats on being asked to join a design team. Not surprised at all as you have a wonderful style. Looking forwar to seeing what you do with them. Dolly here, and I can attest to the fact that as glorious as this glossy beauty is on your screen, it is even more glorious and glossy IRL!! Thank you again, Lolly, for the thoughtful and CASlicious early birthday card! Congratulations on your appointment to another Design Team!! Shery and the team are lucky to have you! I love that you shared the definition, too. I didn't think my style would work at all for this challenge, but now I'm thinking it's not THAT far out of my CZ! Rumor mill has it it is your birthday~ HAPPY BIRTHDAY!! Firstly, I want to wish you the 'Happiest Birthday, EVER'! I hope you have a really wonderful day with family and friends, and that all of your birthday wishes come true! Big Congrats on your new DT spot! This challenge blog sounds perfect for you, Loll! Can't wait to see what you create, and I'm eager to check it out for myself, too...sounds like fun! Love your card for Darnell! Your beautiful, shiny vases really make those lovely flowers pop and I know she is going to love it, too! I love this sweet card for Darnell...those vases look amazing, Loll! Congrats on your new DT spot...awesome news! Looking forward to your Mixed Media creations! Oh your card is fabulous! The vases look wonderful with their shine! Congratulations on your new design team! Mixed media is fun! Hey Loll, Sorry to have been MIA for a bit, but just saw over at Bonnie's that it is your big day! Zipped over to say Happy Bday, and enjoy this spectacular card for our very special Darnell. Love the vases and all that glimmer & glisten. Thanks for the heads up on her birthday. Also big congratulations on your new assignment. I'll check out this new challenge, but I already know you're going to do such wonderful projects. Love this stamp and especially love your own unique treatment using it. Just beautiful. TFS & Hugs too. Loll, I'm so behind in commenting that I *have to* hang my head in shame! All your cards are amazing, and this one for our sweet Darnell is no exception: it's absolutely, utterly, fantastically gorgeous!! Super congrats on the Mixed Media DT! More of your incredible talent to be seen in the blogiverse. And if (okay, when...) I fall behind in commenting, know that I'm still gazing and admiring in complete jaw-dropped, breath-taken away awe!! Great card simple design but so striking. Thanks for joining us over at CAS on sunday. What a great card! Thanks for joining us at CAS on Sunday!